Whether ordinary or offbeat, you can donate items from your closet, garage or attic and make a difference in someone’s life. It’s the perfect way to recycle! The New Canaan Thrift Shop accepts donations of gently used articles of clothing, accessories, jewelry, books, sporting goods, small appliances, housewares, china, silver, paintings, crockery, toys, games, and small home furnishings. 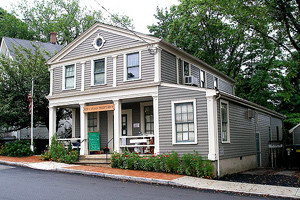 A community treasure since 1930, the New Canaan Thrift Shop is housed at its landmark corner location at 2 Locust Avenue. The New Canaan Thrift Shop is one of the oldest volunteer-run thrift shops in the country and all proceeds directly benefit the patients of Visiting Nurse & Hospice of Fairfield County. The New Canaan Thrift Shop is open from 12 noon until 4:00 p.m., Monday through Friday, and from 10:00 a.m. until 1:00 p.m. on Saturdays. Donations are accepted from 9:00 a.m. until 12 noon, Monday through Saturday. To volunteer, or to donate to the Thrift Shop, please call the New Canaan Thrift Shop at 203-966-2361 or call our Volunteer Coordinator at 203-762-8958, ext. 316. Call us at 203-834-6341 ext. 304 to speak with someone in our Development Department to make your donation. Connecticut Association for Healthcare at Home.